Microsoft is bringing Windows Holographic to the masses with a forthcoming update to Windows 10, in a move to make it easier to blend physical and digital reality on any PC. Windows Holographic will be made available through a software update sometime in 2017, Terry Myerson, executive vice president of the Windows and Devices Group, said at the Intel Developer Forum in San Francisco on Tuesday. Microsoft and Intel are working together to provide minimum hardware specifications for Windows Holographic PCs and headsets, he added. It's part of a push to let more people use what Microsoft calls mixed reality -- either bringing physical objects into virtual reality or overlaying digital objects on the physical world. Right now, Microsoft already covers that second area with its HoloLens hardware, but it's also working with a variety of hardware manufacturing partners like Intel to build new hardware that works with mixed reality. The new capabilities will enable users with PC-powered VR headsets to interact with Windows 10 apps, mixed reality content, and virtual reality content all at once. That’s a major expansion of Windows Holographic, which is currently only available on the HoloLens. The move is a positive one for both companies, as virtual, augmented, and mixed reality all become increasingly popular, said analyst Patrick Moorhead. "Microsoft and Intel working together on mixed reality is a very positive sign and historically, more has been accomplished with the two working together than against each other," Moorhead said by email. "Intel and Microsoft were not aligned in smartphones or tablets, and the result was negative for both." 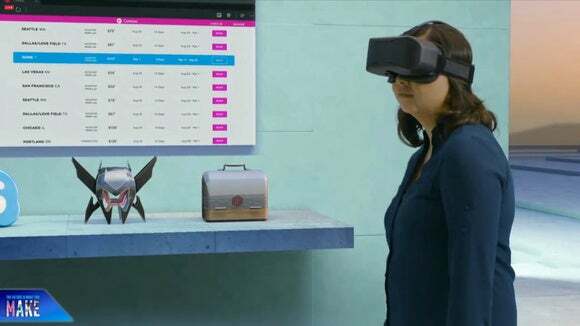 The Windows Holographic announcement dovetailed with the news that Microsoft and Intel are working together on Project Alloy, a wireless headset that uses sensors to bring objects into VR from the real world. Intel will release an open-source set of specifications for building an Alloy headset and allow hardware makers to build their own. As part of the news, Myerson showed off a simple Windows Holographic demo running on a US$600 Intel NUC mini computer. The demo, which ran at 90 frames per second, is an encouraging sign for people who don't have the powerful PCs needed to run the current crop of high-end VR headsets. Microsoft will be outlining more details about its Windows Holographic strategy at the WinHEC conference in Shenzhen, China, this December.